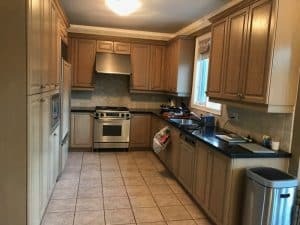 A dark, cramped kitchen under goes a kitchen renovation for a bright, organized, open concept makeover. THE PROBLEM This uninspiring twenty-year-old kitchen was very long and narrow, lacking storage and accessibility. 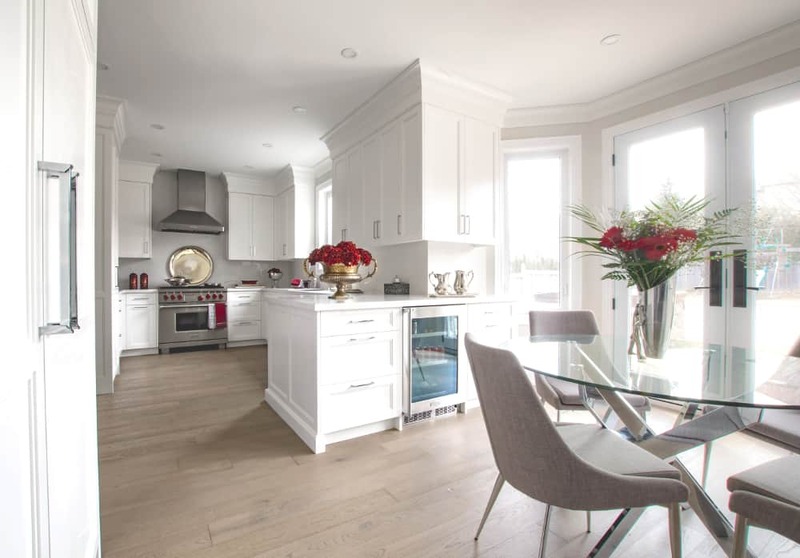 The original plan to remove a wall to make room for a larger kitchen had to be reconsidered when it was discovered that it would require a major rerouting of the kitchen’s mechanical components at a huge cost. 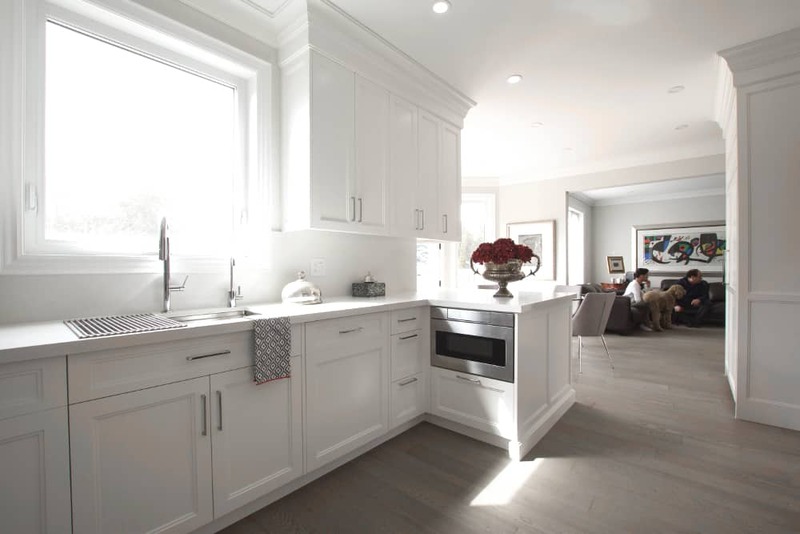 The designers had to head back to the drawing board to create a dream kitchen within the existing space. 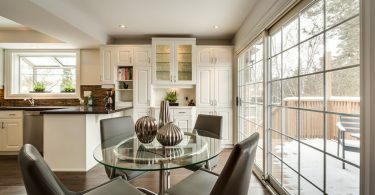 POWER OF TWO When planning this kitchen remodel, the family had the benefit of collaborating with two designers. 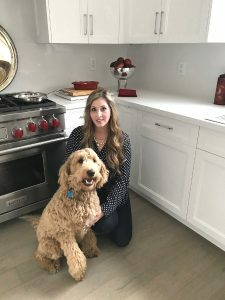 Their designer, Loren Levy, teamed up with Bloomsbury Kitchen Designer Meghan Bordihn, and on-site supervisor, Bentley. 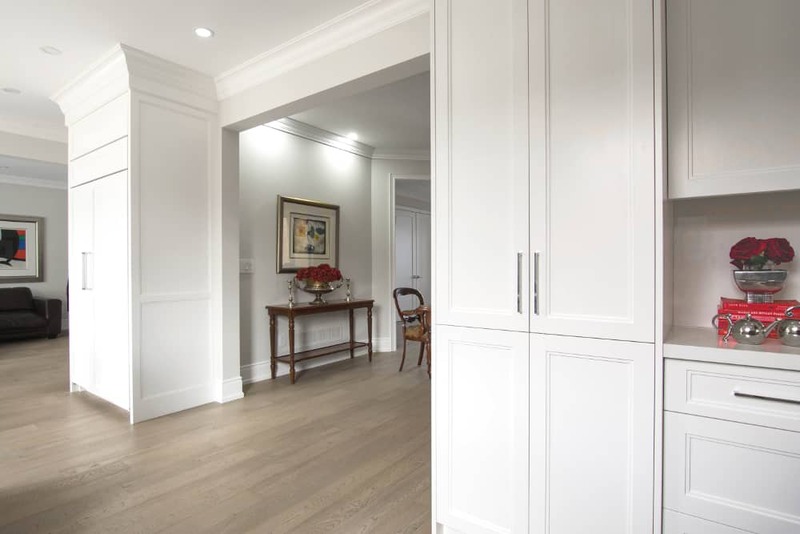 MAXIMIZING SPACE The opening to the dining room was enlarged to allow more light and flow and create space for a full size 18″ deep floor to ceiling pantry. The room was nine feet tall so the design team decided to take the cabinets right up to the ceiling. They selected a very big but straight line, clean profile for the crown around the room to add an air of classic sophistication. 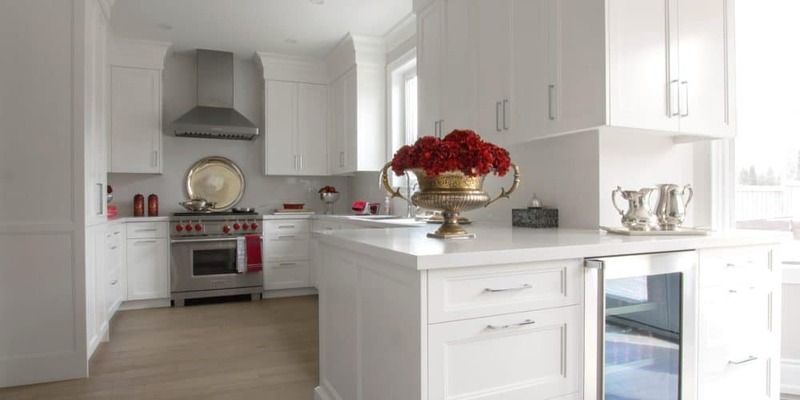 The original kitchen had a desk area that was underutilized so the fridge was relocated to that spot, allowing for a more open feel to the space. The kitchen now feels much more open and connected to the rest of the house. 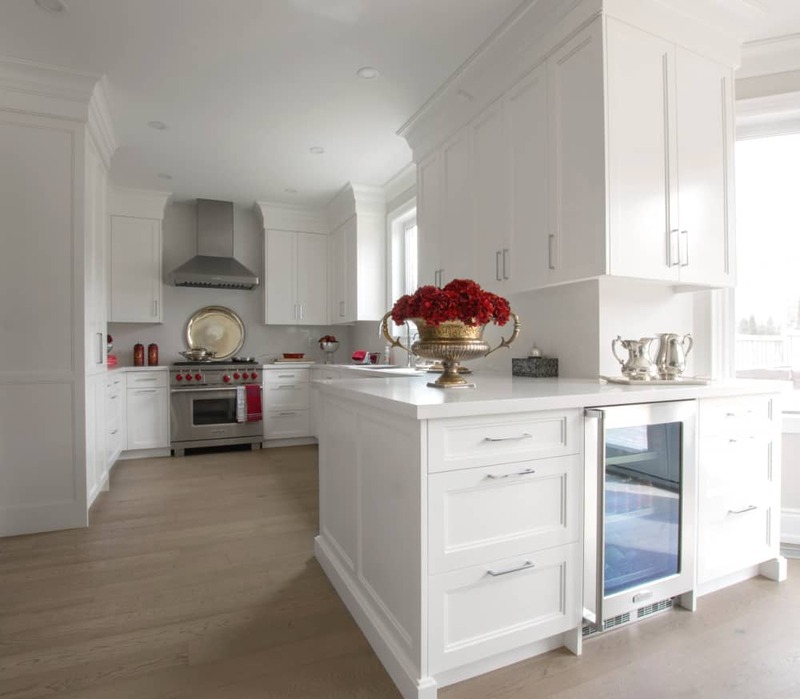 DESIGN SELECTIONS White Shaker style furniture quality cabinetry paired with paneled appliances and Frosty Carrina Ceasarstone were used for this kitchen renovation to create a versatile backdrop for any color palette they wanted to introduce. 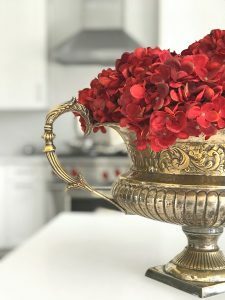 The stove, hood, and hardware add sparkle along with the homeowners’ many interesting Carrol Boyes silver collection pieces from South Africa. 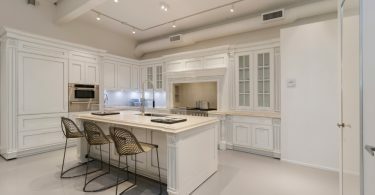 MADE TO ENTERTAIN To accommodate the family’s frequent entertaining, this kitchen renovation features an extra wide island style peninsula that houses a bar fridge and convection microwave, creating an entertaining and staging area with extra countertop space for serving and gathering around.